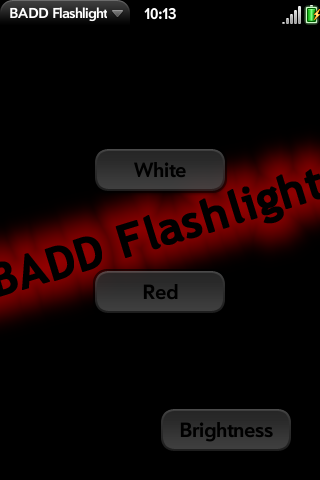 BADD Flashlight is not the flashlight app you're looking for. I haven't updated the app in more than a year and there are much better flashlight options available. The Homebrew patches that turn your phone's LED into a flashlight are best, but the other "screen" flashlight apps are still better than mine. I hope to do one last update, but you shouldn't hold your breath. In addition to the standard white screen, BADD Flashlight features a Red-Light Night Vision mode for astronomy enthusiasts, and others, who use red-light flashlights to protect their dark-adjusted eyes. If you visit the Official Thread Forum, you'll find a solid red background to temporarily swap out with your current wallpaper to protect your night vision. This will eventually become part of the app. I'm still hoping to tap into the brightness api to have BADD Flashlight automatically brighten and dim as you launch and close the app. BADD Flashlight may be at the bottom of the webOS barrell, but that barrel will be well lit. ISSUES: Menu and About dialog are too bright and may damage your night vision. Don't use them.